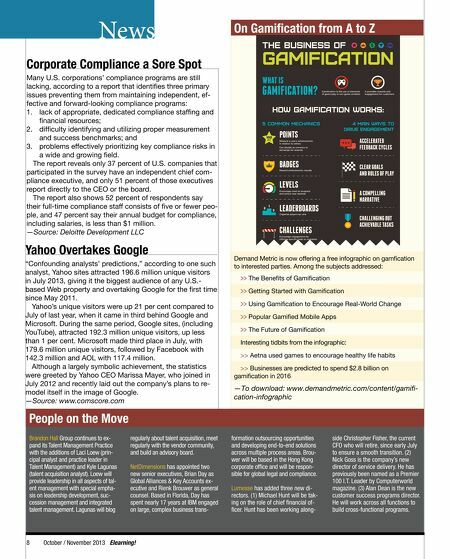 News On Gamifcation from A to Z Corporate Compliance a Sore Spot Many U.S. corporations' compliance programs are still lacking, according to a report that identifes three primary issues preventing them from maintaining independent, effective and forward-looking compliance programs: 1. lack of appropriate, dedicated compliance staffng and fnancial resources; 2. diffculty identifying and utilizing proper measurement and success benchmarks; and 3. problems effectively prioritizing key compliance risks in a wide and growing feld. The report reveals only 37 percent of U.S. companies that participated in the survey have an independent chief compliance executive, and only 51 percent of those executives report directly to the CEO or the board. The report also shows 52 percent of respondents say their full-time compliance staff consists of fve or fewer people, and 47 percent say their annual budget for compliance, including salaries, is less than $1 million. —Source: Deloitte Development LLC Yahoo Overtakes Google "Confounding analysts' predictions," according to one such analyst, Yahoo sites attracted 196.6 million unique visitors in July 2013, giving it the biggest audience of any U.S.based Web property and overtaking Google for the frst time since May 2011. Yahoo's unique visitors were up 21 per cent compared to July of last year, when it came in third behind Google and Microsoft. During the same period, Google sites, (including YouTube), attracted 192.3 million unique visitors, up less than 1 per cent. Microsoft made third place in July, with 179.6 million unique visitors, followed by Facebook with 142.3 million and AOL with 117.4 million. Although a largely symbolic achievement, the statistics were greeted by Yahoo CEO Marissa Mayer, who joined in July 2012 and recently laid out the company's plans to remodel itself in the image of Google. —Source: www.comscore.com Demand Metric is now offering a free infographic on gamfcation to interested parties. Among the subjects addressed: >> The Benefts of Gamifcation >> Getting Started with Gamifcation >> Using Gamifcation to Encourage Real-World Change >> Popular Gamifed Mobile Apps >> The Future of Gamifcation Interesting tidbits from the infographic: >> Aetna used games to encourage healthy life habits >> Businesses are predicted to spend $2.8 billion on gamifcation in 2016 —To download: www.demandmetric.com/content/gamifcation-infographic People on the Move Brandon Hall Group continues to expand its Talent Management Practice with the additions of Laci Loew (principal analyst and practice leader in Talent Management) and Kyle Lagunas (talent acquisition analyst). Loew will provide leadership in all aspects of talent management with special emphasis on leadership development, succession management and integrated talent management. Lagunas will blog 8 regularly about talent acquisition, meet regularly with the vendor community, and build an advisory board. NetDimensions has appointed two new senior executives, Brian Day as Global Alliances & Key Accounts executive and Rienk Brouwer as general counsel. Based in Florida, Day has spent nearly 17 years at IBM engaged on large, complex business trans- October / November 2013 Elearning! formation outsourcing opportunities and developing end-to-end solutions across multiple process areas. Brouwer will be based in the Hong Kong corporate offce and will be responsible for global legal and compliance. Lumesse has added three new directors. (1) Michael Hunt will be taking on the role of chief fnancial offcer. Hunt has been working along- side Christopher Fisher, the current CFO who will retire, since early July to ensure a smooth transition. (2) Nick Goss is the company's new director of service delivery. He has previously been named as a Premier 100 I.T. 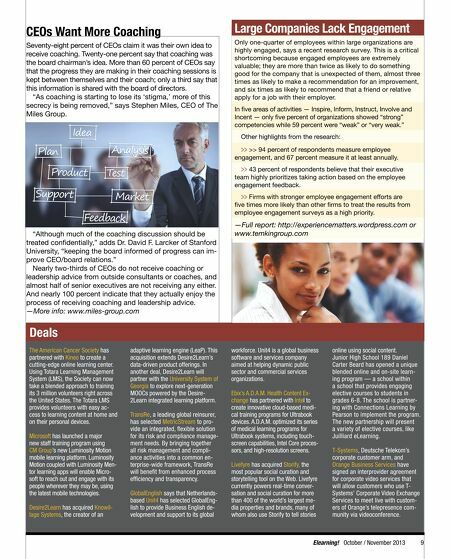 Leader by Computerworld magazine. (3) Alan Dean is the new customer success programs director. He will work across all functions to build cross-functional programs.